As the 7th busiest in Philippines and 3rd in Western Visayas, Boracay Airport is definitely the most perfect way to arrive via air travel if you want to come to the white beach paradise island. Pinoys, balikbayans, kabayans, Pinays, tourists and curious beach bummers all look forward to travel the fastest way possible with the cheapest airfare available while considering convenience. So for your benefit, let the Aklanon guide you on your travel to Boracay. What a great way to arrive and discover Boracay Island beach resorts in Aklan than to come from the Caticlan airport strip. First, it is just less than a minute drive to Caticlan Jettyport (Caticlan Tabon Boat Terminal) if you have a transportation service availed as part of hotel packages in Bora compared to Kalibo airport. From Kalibo, it will take you more than 1 hour to arrive in Caticlan alone via van transport which costs 100 pesos to 150 pesos whereas you don't have to spend anything when you come from the strip - Second, by walk from the airplane terminal, it is just around 10-15 minutes away. Boracay airport is best for backpackers with less baggage to handle and even more ideal for those who have large bulk excess baggage. Third, the less time travel gives tourists, honeymooners and travelers the advantage and convenience combined. The Caticlan landing strip or Boracay airport today has recently been modified in the last quarter of 2013 and is now available to take in flights to and from Manila to Caticlan via Cebu Pacific, Air Asia (Zest Air) and Philippine Airlines flight plane carriers. For those who still didn't know, there is literally no airport inside the white sand beach island. 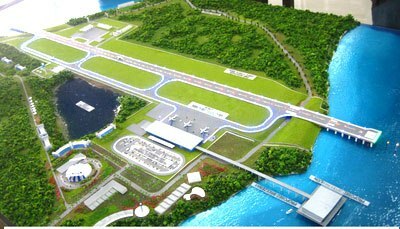 Whenever there is something mentioned like Bora airport, it is meant to be Caticlan strip. Very few know that there are actually 2 port gateways coming from Caticlan to arrive in Boracay Island proper. We discovered this 2 routes when bad weather and a typhoon happened to arrive in our time of departure to the island going to Jetty Port of Caticlan. What is referred to as Boracay Airport is actually the Caticlan Airport strip. Boracay is still a 5-10 minute travel away via airconditioned speed boat or the classic motor boats sometimes referred to as "parao" or "baroto" or "ferry boat" by the local Aklanons in Malay and other parts of the province. The fees are very minimal and would include environmental fee per head on each tourist in Jettyport. Environmental fees are waived and free for Aklan residents. As a tip, be sure to ride only with ferrys having the orange life jacket for your safety. The boat trip is a 2 km trip with a nice view of the blue ocean and white sand below the shallow sea water as you get excited seeing the white sand beach coastline. From the Boracay ferry boat terminal, you will be obliged to take a service jeep or tricycle taking you to either Station 1, Station 2 or Station 3 destination. If you are looking for airport hotels in Boracay, you won't find one. There's probably a few motels and small rooms to rent while in Caticlan but definitely no hotel in the area. Most would be found inside the island. If you want a list you can try to visit our post here. Just for information for tourists trying to find how to get to Boracay. There are only 2 entry points if you are traveling by air and these are either thru Kalibo Airport or Caticlan Airport (Godofredo P. Ramos Airport). You won't have problems traveling from this airport because you can literally see where the jetty port is where you will take a short ferry ride going inside the island. There are even airport service vehicles available to take you to the ferry port at the tourism office. A Caticlan airfare costs from Php 2500 - Php 10000 without a promo fare, a rare discounted price offer of Php 800 pesos may be available for flights at least 1-2 months on early reservation. 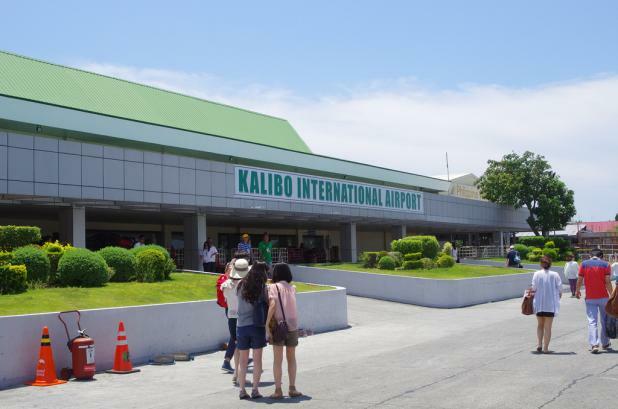 Kalibo is the most popular entry point if you are going to Bora. It is also the cheapest way to get there if you try to compare the airfare fees. A Kalibo airfare will cost you from a promo fare of Php 500 - Php 2500 for flight reservation as early as 2 months before schedule visit. It may cost you still a little bit lower than if you try to get seats for a Boracay Airport (Caticlan). 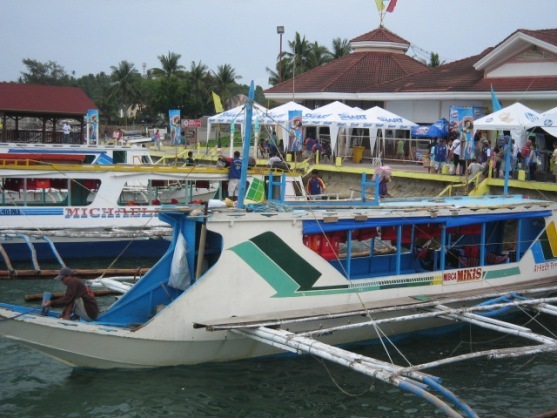 There are so many ways you can use to get to Boracay Jetty Port (the ferry boat terminal to the island). We have lined up your choices so you know which one to take via a comparison. Van Transfer - this trip will cost you from Php 150 - Php 500. To get to a van terminal going to Caticlan, find the airport tricycle service going to the city proper. Ask the driver to take you to the Buruanga or Caticlan van terminal. Tricycle - It will cost you so much trying to rent an exclusive trip going to Caticlan via a trike. It is only an option for emergencies like if you really need to get there and no transport is available which is usually at night. This special trip might take you longer in a more dangerous curved path at the most expensive fare. Fees may range from Php 1000 - Php 2000. I do not suggest this option at all. The highway to Caticlan is full of unexpected dangerous curves and ridges. Airport Taxi - today, just a couple of weeks ago, October 10, 2015, me and my dad went to Boracay via Kalibo airport. I was surprised to find that there were actually so many airport taxis (yellow-colored taxi cab) waiting outside for service customers looking to go to Bora. I'm not so sure how much it may cost you to take this mode of transportation but rest assured that this is a metered taxi. Ask first from the driver how much it usually costs taking this ride before you jump in. Ceres Bus - for those who didn't know it, there is one bus traveling daily to Caticlan on a per scheduled regular intervals departure basis. This is the Ceres Bus. If you want to catch departure time from Kalibo, you have to come over to the station. To get there, you must take a tricycle ride and ask the driver to take you to Ceres Bus terminal in the heart of the city of Kalibo. Trips will range from just Caticlan or Buruanga. These 2 trips are your choices. For the fare, it only costs Php 120 pesos per head and much faster travel awaits the adventurous you. Jeepney - There are jeepneys traveling to Buruanga via Caticlan Boracay airport and with this option, I am not so sure where you can catch the jeepney terminal to take the ride. Cost will usually range from Php 100 - Php 150 per head just like the Ceres Bus ticket costs above. Reminder: If you are not in a hurry to get to Boracay, rent a cheap hotel somewhere in Kalibo. You can take the orange-colored airport tricycles (cheapest transport to the city). Ask the driver to take you the nearest cheapest comfortable hotel in Kalibo and I'm pretty sure you'll find a lot of choices. It might just cost you Php 100 pesos for the trike and additional Php 500 for the overnight stay in a cheap hotel with comfy electric fan. 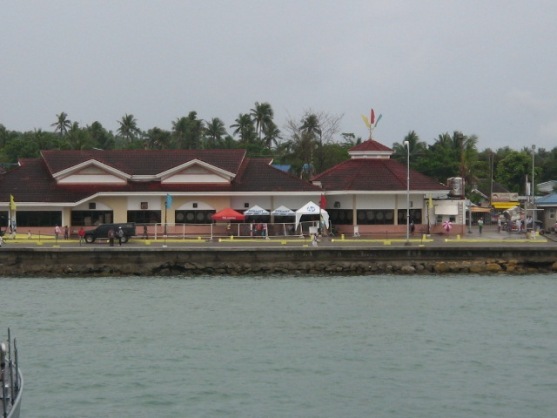 If you are coming from Boracay airport, you won't need a hotel as the jetty port is just walking distance from there. Making it simple and easy to understand, flight schedules to and from Manila to Caticlan airport is posted below. I heard there are already some direct flights to Boracay airport (in Caticlan) coming from many neighboring Asian countries like Korea, China, Singapore, Thailand, Japan and more. Just inquire in your nearest ticketing agent from your country of origin. As for now, just for the record, there are just 3 airbus planes coming to the island and these are just Cebu Pacific, Air Asia (Zest Air) and Philippine Airlines (PAL). To see available flight schedules, please go to each of their official websites here, here and here. You can otherwise reserve or book a flight to Boracay from Manila using their respective online reservation system or by coming over in person to a catering branch or at the PAL office. It's all simple if you want to get to the strip (Boracay Airport). If you already took a flight to Boracay via Caticlan, that's just about it. In the meantime, I have a map for those who don't want to get lost in the island and for tourists who will come from afar.